"Keeping Our Community Alive for 80 Years"
This squad was originally sponsored by a few who saw a need for such an organization in the community. On March 9, 1937 this organization was formed and on April 10, 1937 was incorporated as the Scotch Plains Rescue Squad, Inc. 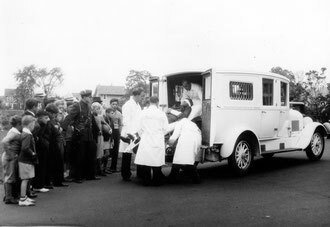 The squad purchased its first vehicle in 1937; a used 1924 Kensington ambulance from Muhlenberg Hospital for $250. This ambulance was housed at the municipal building and members responded when the siren sounded. The original squad numbered about twenty members and all were qualified in advanced first aid work. Service began by answering calls in Scotch Plains, Fanwood, Mountainside and New Providence. 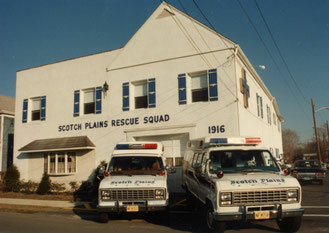 As of November 1937, the Scotch Plains Rescue Squad was the only independent and privately maintained organization of its kind in Union County. The squad purchased its own building on Bartle Avenue in 1943 from William Meyer for $3,000. The dedication ceremony took place on March 4, 1945. Since that time the building has undergone two additions and extensive renovations to accommodate the growing membership and the needs of the township. 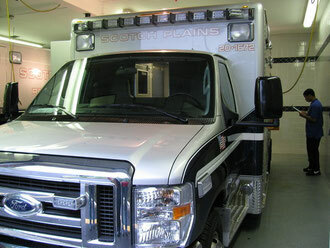 The building is now approximately three times the size and houses two modern ambulances. The squad remains the oldest of all volunteer rescue squads in Union County and one of the oldest in New Jersey. The squad has members of various ages and walks of life, some students, some work full-time, some have children. The professions range from doctors, nurses, lawyers, accountants, engineers, graphic designers, police officers, and teachers. Members have also served our communities in the military, law enforcement, fire department, religious leadership, and many others. Some of these individuals have served a few hours per a week and others serve much more. Many volunteers stand-by through the night for overnight emergency calls. All members are dedicated to serving their community and often sacrifice time away from family and friends. Each active member is a certified Emergency Medical Technician (EMT) by the New Jersey State Department of Health and Senior Services and each member is also certified every two years in CPR. Currently, EMT training requires approximately 120 hours and also includes volunteer time in the emergency room at one of the area hospitals. Squad members are present at many community events to convey the various services they offer for the citizens of Scotch Plains. 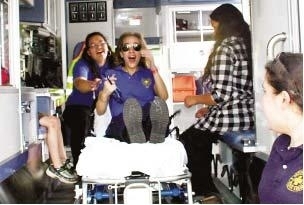 Throughout the year, the squad offers special demonstrations, CPR classes, and participates in township Memorial Day and Scotch Plains Day activities. There, the members of the squad meet residents and communicate their appreciation for the continued support of community residents. During the past few years, the Scotch Plains Rescue Squad served as a sponsor of the Scotch Plains Summer Concert Series held throughout the summer at Alan Augustine Village Green. For the past seven years, the Rescue Squad Auxiliary has coordinated pancake breakfasts as a fundraising effort. The squad welcomes new members as well as those interested in contributing time and talent to support the organization. Individuals can apply for membership at eighteen years of age or serve as a cadet at age sixteen. Those ages fourteen or older can serve on the Scotch Plains Rescue Squad Auxiliary. For more information about becoming a Scotch Plains Rescue Squad member, auxiliary member, volunteer, or to make a donation, contact scotchplainsrescuesquad@gmail.com or call (908) 322-2103 any weeknight between 6:00p.m. and 11:00p.m. The rescue squad also has many services available for those in the community with need. Hospital equipment, such as wheelchairs, canes and crutches are available for use, free of charge. The rescue squad relies on ongoing community support. These contributions enable the squad to fulfill their motto, Neighbors Helping Neighbors. We Work For Pride Not Pay. The squad looks forward to continued growth with the township of Scotch Plains as they faithfully serve those who call for help. Neighbors Helping Neighbors. We Work For Pride Not Pay.